Hands down, the biggest challenge at InfoComm for me is squeezing in as many booth appointments as possible, in attempt to best have my finger on the pulse of the industry. Now that the show has come and gone, and I feel like I was able to catch a pretty broad spectrum of technology in my meetings, I want to recap as much as possible. Keeping in mind that it’s pretty impossible to hit everyone in one concise blog, my strategy is to provide a quick rundown of some of the booths I visited and the elements I took away from them. DLP chose to host a press preview off of the show floor this year, where they highlighted a hybrid, 3,000-lumen short throw projector, and a multitouch display prototype, using sensor technology. The ability to turn any surface into a fully interactive touchscreen was quite impressive, but was no word on any product in development. When questioned, executives implied it was looking much further down the road before implementing the interactivity function into a product for market. Over at the Black Box booth, several new digital signage players were on display, including the Q Series iCompel (Q for “quiet”), a scaled, fanless player. The player’s finned design features a heat sink in the case for cooling and heat dissipation. The ServSwitch Agility system is used to extend HD video and provide KVM switching, useful for command and control and other mission critical applications. Black Box was also featuring the new MediaCento IPX Multicast extender, and IP streaming solution that multicasts HDMI audio and video to as many as 250 screens on a network—a great solution for video walls. Stewart Filmscreen presented various projection screen material, including the Mystik adhesive material, which was shown in a retail digital signage application. Stewart displayed the material with a touch overlay, by PQ Labs, for interactive use. Following the theme of interactivity, Leon Speakers had its Horizon Interactive Series of vocally optimized audio solutions, for telepresence and video conferencing systems. A camera cabinet is custom-built into the speaker for full range of motion for cameras by Tandberg, Polycomm, and Sony. The speakers were shown with an interactive touch display from Dynics. 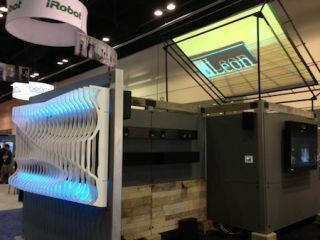 Leon’s booth also highlighted a custom sound sculpture, which was a striking décor element doubling as a speaker system. I could easily see that in a chic restaurant or hotel. Touchscreen technology wasn’t simply about interactivity at InfoComm, as Sony had on display its new Anycast Touch portable, live production system. Anycast Touch combines a video switcher, audio mixer, special effects generator, PTZ camera control, a real-time streaming encoder, image still store, character generator, and scale converter. The name stems from the sliding, dual touchscreen interface, designed to resemble a tablet. The two dual screens can split video and audio controls and store them in scene folders with settings. Draper had its standard projection screen materials on display, but one tool that struck me as really different was its videoconferencing backgrounds, a concept that is a easy to leave out when planning videoconference meetings, yet is fundamental to upholding a professional image. Even the sight of coworkers in the background can be distracting. There are various neutral backgrounds available, or companies can opt for custom images, including logos. Check back to AVnetwork.com tomorrow for my continued rundown of InfoComm booth visits.